This article demonstrates how to create a Web API RESTful service and use Elasticsearch as the persistence infrastructure. Nest is used to access Elasticsearch store. Simple CRUD is supported in the controller. The Application structure is based on the onion pattern. The business layer contains the domain model and all the provider interfaces. The Web API service layer uses unity to create all instances. The business layer has no dependencies. Provider implementations have dependencies to the business layer. Due to this architecture, Elasticsearch could be replaced with MS SQL server or MongoDB. The application has just dependencies to the provider interface and one reference where unity registers the Elasticsearch provider. This is a simple pattern which can also be used for implementing portable libraries. This layer is the core of the application. In a large or professional application, the layer could be split. The important thing in this assembly is that it has no dependencies. The provider interfaces, domain model and the core classes are define here. The SearchProvider interface provides the CRUD operations required for the domain model class Animal. In a later version, the search functionality will be added. The animal manager class implements the business logic if required. For example, domain validation could be defined here. As this is just a demo application, the api events are sent to the ISearchProvider without any extra logic. The domain model is just a simple class for this demo. This provider implements the ISearchProvider from the business layer. This could be replaced with a different persistence provider, for example one which uses SOLR or MS SQL Server, all depends on your needs. 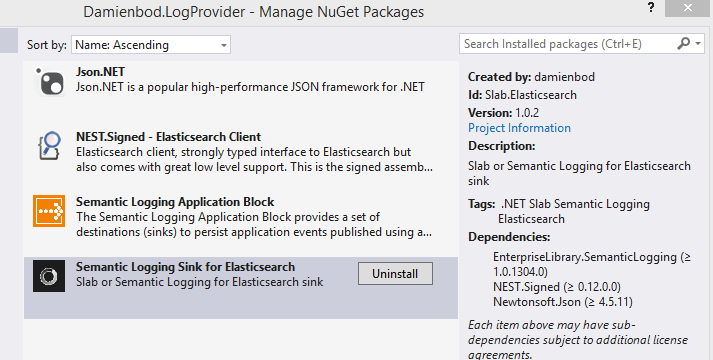 Nest can be included in the project using NuGet. The Index method from the Nest Api creates a new document in the search store or if a document already exists with the same Id, it will be updated. Due to this, the application prevents the update by throwing an exception if the document exists. The ValidateIfIdIsAlreadyUsedForIndex method uses the Search method to check if the document exists. The update method will update a document in the store if the document exists, otherwise it will create a new one. The GetAnimals method returns all records from the store using the search method. This is not very practical if a lot of records exist. It is just used to test the application for this demo. The DeleteById method deletes an animal type from the animals index which matches the id provided as a parameter. This Provider uses Slab.Elasticsearch to log events to the Elasticsearch store. 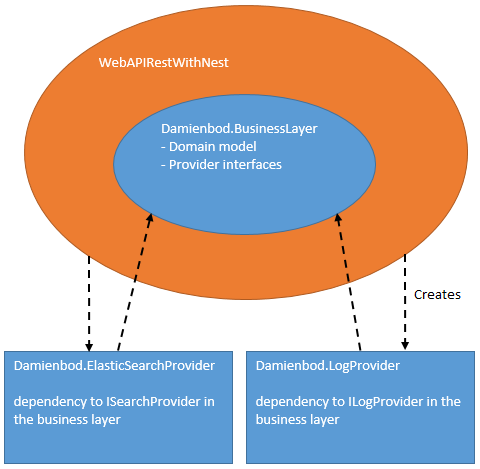 The Slab.Elasticsearch package uses Semantic Logging from the Enterprise Library and also the Nest Api. The provider uses the ILogProvider from the business layer. This provider could easily be replaced with a log4net provider or a NLog provider. The Events for logging are defined in the ServiceLayerEvents class or one of the other event classes. The demo application uses SLAB out of processing logging. See Semantic Logging with Elasticsearch for details on how to configure the package. OUT-OF-PROCESS configuration for slab logging. This Layer is implemented using a MVC web application with a Web API RESTful service. This could also be defined in a windows service as the Web API uses OWIN and can be hosted anywhere. The AnimalController class is used for the service. This class uses attribute routing to define the routes. 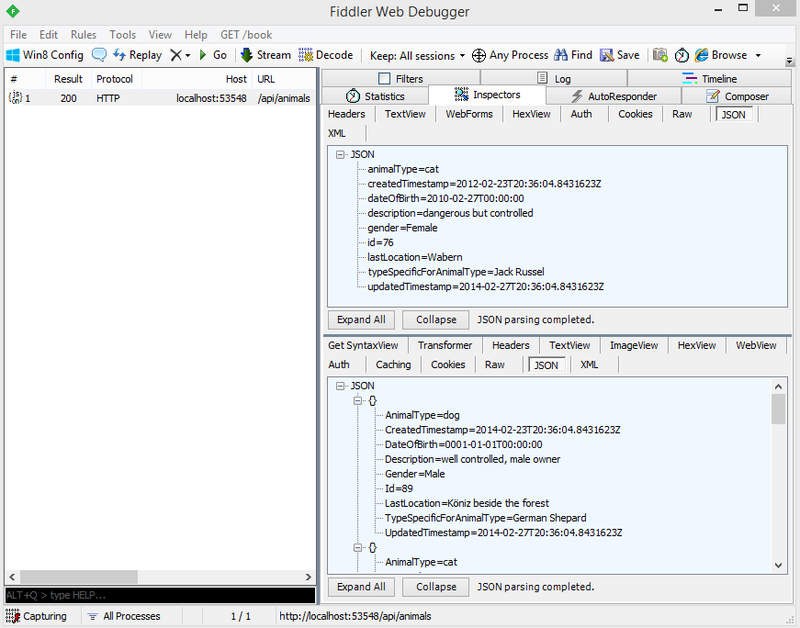 The Routing configuration is added in the WebApiConfig class found in the App_Start folder. This class also adds Unity to the Web API. The controller uses ActionFilters to log the service HTTP GET, POST, PUT, DELETE methods. This is added using an attribute and adds a log before and after the method execution. Exceptions for this controller are handled using the AnimalExceptionFilterAttribute class. 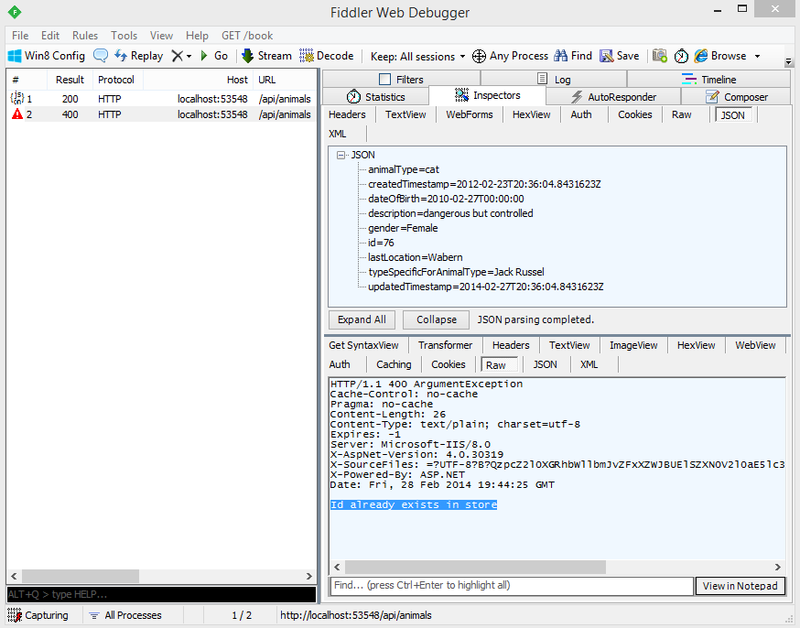 All unhandled exceptions are logged using the SlabLogExceptionLogger. This implements the IExceptionLogger interface using the ExceptionLogger class. The service can be tested using curl, fiddler or postman. If the create method is used for an existing document, the service returns a bad request. Now that a basic application is setup to do CRUD operations with Elasticsearch, the service can be extended to implement some search logic. Do you happen to know the error? Thanks for your comment, I’ll have a look at this and update the post. What are you using to browse the documents in elastic search in the above screenshot, is it a plugin?